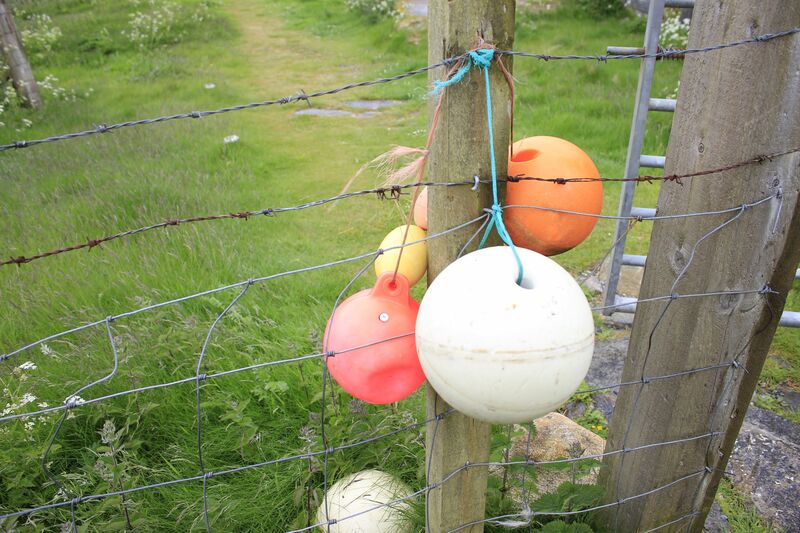 Crofting life on the islands of the Outer Hebrides has always been intimately connected with the sea – as a source of food, myth and legend. As you travel north from Tarbert, Harris the road climbs up hugging the coast. Rounding the headland and turning inwards towards the wild interior of the northern part of the island there is a view across the bay to a single chimney overlooking the sea at Bunavoneadar, the last vestige of Harris’s lost whaling industry. It was started by Lord Leverhulme a previous owner of Lewis who envisaged a more prosperous future based on fishing rather than crofting. The whaling station was successfully run by Norwegians employing local people at various times during the twentieth century and finally closed in 1953. Today, as Seonag McVicar recounts in an interview with Caitriona Maccuish, the main local fishing catches are lobster, crab and shellfish which are mainly sold to the foreign market. Whales can however be spotted around the coast and occasionally one gets washed up on a deserted Hebridean beach. In 2006, I sat looking through the misty soft rain towards the ruined chimney and listened to a ship motoring into the sea loch below, almost right up to the whaling station, lifting lobster pots. A little further up the road is the spot where on two separate cycle tours from the south to the north of the Outer Hebrides I was defeated by a mixture of horizontal rain and a ferocious headwind and gratefully turned around and headed back towards Tarbert and the gentler south. On one of those journeys I remember the sound of a weaving loom from inside a shed as we passed it on the road. ‘Once Where Whales’ includes the voices of Donald MacSween of Ness and John Maclean from Berneray recorded by Cathy Lane; Seonag McVicar talking about working on fishing boats as part of the Taigh Chearsabhagh oral history archive in Lochmaddy and Curstaidh Mackay reciting a rhyme about food (particularly shellfish) boiling times which was recorded in 1977 by D.A. MacDonald for the School of Scottish Studies. The waulking song ‘Cha Deid Mi Do Dh’Fhear Gun Bhata’ (I’ll Nor Go to a Man without a Boat) was recorded in Benbecula by Alan Lomax in 1954 and tells of the superiority of the skipper of a fishing boat over other men.